WAGS 23rd March. Best Yet! Crew: Mani, Rona, Rob, Mark, me. What a fabulous day! The weather was fine and the forecast was good. We lined up for an anti clockwise rounding of Green via Hope Banks in beautiful sunshine and very little wind. Our start was within a minute of the gun, and with very little wind directly behind us we poled out for a run to the banks. Dreamagic is settling into RQ Wags and each week we are improving. Most of the yachts here are old timers who race with the same crew doing the same jobs. They know the bay intimately and use the wind and tides to their advantage. 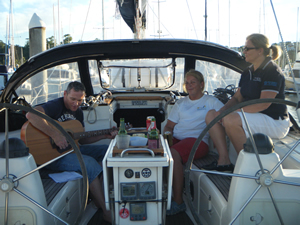 We started with a Farr 1104 and an Adams 10. 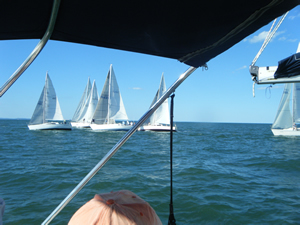 They had their spinnaker poles out just over the line and pulled about three boat lengths ahead of us by the time we had ours set. Once done, we all sat together for the 5 mile run to the mark. Had we been quicker at the pole we could have gained those lengths, that said our crew had NEVER set the pole before so a fantastic effort by Mani, Mark and Rob. Rounding Hope Banks the wind had filled to a steady 18 knots and Dreamagic settled into doing what she does best. Our initial tacks were a bit sloppy but again we have a brand new crew. By the cardinal marks at Green Island the boat was turning like a sports boat and we were pulling the fleet back. The wind had now built to some 20+, Dreamagic was doing mid 8's and everyone was having a great time. This was the first WAGs where we have got it together and we crossed the line just behind boats that normally beat us by miles, and ahead of many that we normally follow. Parking was not the normal smooth event it usually is but we finally got her secured. Sorry that both Mani and Mark had to dash off but Rona produced cheese and biscuits, Rob serenaded us with his guitar and we finished the evening in true Dreamagic style. Unfortunately not everyone had a great day. 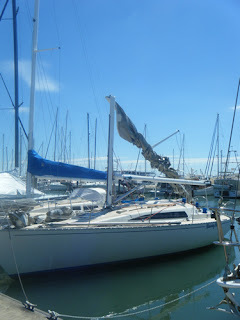 Dancing Lady, a boat berthed opposite us had collided with another yacht and snapped her rig. No one was hurt which was a blessing but the crew were in shock and looking very forlornly at a severely damaged boat. Linda came down to join us for drinks and the four of us adjourned to the bar to listen to the singer (who was not as good as our own!) and for a race post mortem. Ouch! Fortunately no one was hurt. A great day! Thanks guys. Back in the dark days of 1977 three yachtsmen at the very prestigious Royal Queensland Yacht Squadron got togther and decided to have a fun race outside the organisation of the club.The course was around Green Island. It was that much fun that they decided to make it a weekly event, and as they were wagging off work, WAGS, and acronym for for Wednesday Around Green Sailing, or Wednesday Aftrenoon Gentlemens sailing, was created. The event became more and more popular, and in turn was frowned upon more and more by the RQYS who thought that it was somehow disreputable. Entry was $5 and at the end of every year the money collected was spent throwing a party for the participants. I started getting involved in about 1989, in a Cole 23 called Fiesta III. One of the smaller yachts certainly but not the smallest. John Bush was the organiser and with the aid of his famous "Black Box" handicapping system the organisation was simple. You raced, and if you won your handicap was adjusted so that you couldn't win again that year. No one took it seriously, protests were banned, and anyone who actually complained about performance was penalised. I sold the Cole and a few years later came back and raced in my SS Defiance 30 "Carpe Diem". 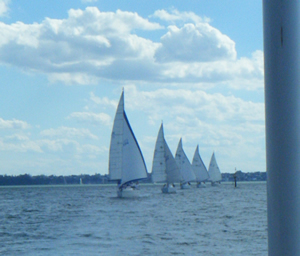 The race was still around Green Island and the 30 footer was a middle of the fleet boat. John was still the organiser and based on the theory that if it isn't broken don't fix it, organisation was basically the same. The only difference was that where the end of season party was a free drinks for everyone, because of gate crashers it was a ticketed affair. Fair enough. In 2009 I came back in Dreamagic. At 44 feet I would expect to be up the front but things had changed somewhat. RQYS had realised that there are more people in the bar on a Wednesday afternoon than for the rest of the week combined. Having had a change of heart at the events value to sailing, they had taken over the running of this strictly amatur event and made a few changes. The name of the event has been changed from Wednesday Afternoons Gentlemens Sailing to the more politically correct Wednesday Afternoons Go Sailing. There is a miriad of waivers to sign before we could go out sailing at all. Although we are members of Cairns Yacht Club and Yorkeys Knob Boat Club, we can't race here more than twice before having to join RQYS at a cost of $800 plus a mamber nomination fee of another couple of hundred dollars. There is a start boat and going over early, even by a second will incur a penalty. 40 feet is almost a minimum length for yachts. It's hard to find a white sail with all the spectra, mylar, lala being hoisted. Because of the speed of the fleet now, around Green Island is too short so the course is extended to Hope Banks. The crowd is still great, the bar is the place to be when it's over and there is a singer with a guitar to listen to as we re enact he events of the day over a cold beer. That said I can't help feeling nostalgic for the days when WAGS sailing was a pastime for most, a sport for a few and a profit making exercise for no one.